Last October we traveled to Mexico for a seven day paradise vacation. Since then, two groups of friends have booked their stay at the same house for the same week long getaway. I am so excited for all of them, but also a tad bit envious that they won't be able to pack me in their suitcase. One of the groups are leaving tomorrow. I chatted with my friend over the phone this week to share tips on our trip, give recommendations and packing ideas. After we got off the phone, I immediately called Ross to remind him about what a glorious time we had and that we really needed to book our second vacation there stat. He laughed and told me maybe one day. One day? That wasn't the response I was looking for. So, I took matters into my own hands and mind. I dressed the part and pretended for one day that I would be catching a plane to somewhere, anywhere that entailed a beach, infinity pool, drinks with little umbrellas, snorkel gear and lounge chairs in the sun. It worked for about 2.2 seconds and then I snapped back to reality when my girls said "we are bored" for the tenth time. It looks like the community pool and playground will be my wonderland for the time being. I am okay with that. It's life, but that doesn't mean I can't play dress-up, use my wild imagination and escape to someplace tropical even it's only for a few minutes out of the day. I have always been a dreamer. I even made my own wish list of what I would take with me to paradise. Maybe I have more time on my hands than I thought. If you are planning a summer beach vacation, take a look at some pieces that you really need to pack so I can live vicariously through you. Happy shopping, vacation planning (literally or in your own mind) and have a great weekend! You look the part, of a summer getaway. Such a cutie, like always! The first dress on your wish list, I made a post about! Great minds Shanna, get minds..ha! Ooo I love the cutout on the back of this dress! And the hat just makes it ten times better! How I wish I was going away somewhere for a few days, well you look the part. Love this outfit. That dress is sweet. I love the cut out in the back. A nice vacation like that would be fantastic! I don't think we are doing anything like that anytime soon if that makes you feel better haha :) The dress looks amazing on you, I love the back of it! Just yesterday a particular song came on the radio, and suddenly (in my mind of course) I was back on a beach in Antigua...for about 60 seconds. I know how you feel! By the way - I have been eyeing the embroidered clutch you featured- love! Love your outfit! Cute dress. This dress is beyond cute on you! I'm definitely with you on the vacationing in my mind. We didn't get a big vacation this year, but I'll be soaking up some pool time to make up for it! Great pics! They capture the vacation state of mind for sure. I'm frequently vacationing in my mind! That dress is so cute with the back cut out! Oh, how I wish I was going on a tropical vacay! I can pretend since my beach now has palm trees they planted, ha :) Have a great weekend, Shanna! I absolutely love this dress! It's all serious in the front and party in back. So, so cute! love that necklace! And that hat is to die for! so summery! it just gives you an other perspective doesn;t it? I am feeling the same way!! Yesterday was my husband and I's wedding anniversary and for the last few years we have vacationed in Mexico where we honeymooned and this year we didn't go! So we did the best next thing, margaritas and chips and salsa at our favorite Mexican resturant! It helped somewhat lol! Dying to go away soon though! Absolutely love your dress! You look picture perfect for a vacation! i love the back cutout of this dress! and i want a tropical vacation too, that sounds perfect right about now! Adorable dress - dreaming of a beach vacation as well! The print on that dress is so pretty! Love the sandals too... they look nice and comfy too! Gorgeous! Love the back of that dress!! Love this dress!! Great outfit. Haha...I know how you feel. We went to Hawaii for a friends wedding so my husband said we couldn't take a trip for our wedding anniversary this year. But you look super cute anyway! Love the dress with the floppy hat! Love this pattern. Plus the cut-outs are adorable! Awww it's always SO hard to hear that people are going on vacation somewhere we loved, and not be able to go! I love that you decided to dress the part anyway! The dress is adorable and I love the back!!! 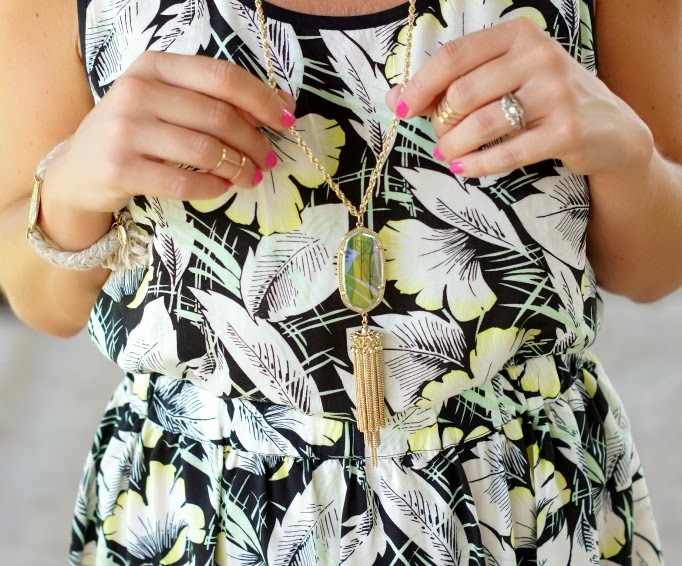 What a fun dress and I love this necklace you paired it with!